My kids LOVE playing with egg shakers! They’re so much fun, easy to make, and (surprisingly) last for a long time. I was just making a bunch for my son’s preschool class and realized that not everyone has made them before! 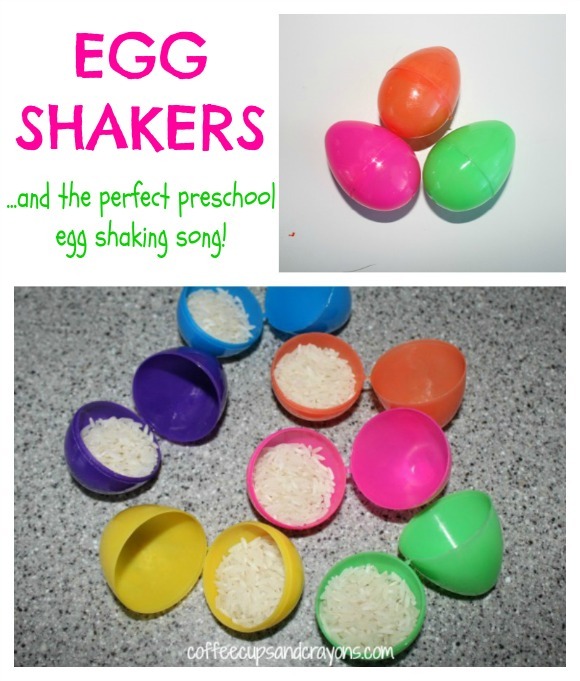 Egg shakers are good for older preschoolers who don’t put toys in their mouths, but even the big kids will still need to be supervised since the glue is only so strong. And now for the best egg shaking song…. I Know a Chicken by Laurie Berkner! And the song she came up with is perfect–it gets kids moving and shaking and is so much fun! What are your preschoolers’ favorite spring songs? My kids also love Eggbert the Easter Egg and our Eggbert Puppet! We love egg shakers at our house! It’s always the simple things that are the most fun!